Custom Beaded Watch -Summertime Seashells! A customer had purchased our lovely Moss Agate Pearl Elegance Beaded Watch (W09) and loved it so much she returned with a custom watch request. She asked for a beaded watch featuring a Czech clam shell white pearlized bead that was used in a previous bracelet design of ours. To change it up for summer and add a bit of glam to the design I create a template design using a blue satin Swarovski crystal. But while looking at my beads I saw I had some Aventurine gemstone heishi beads in stock and thought that might look nice too. So I create a template using both colors and she loved both so much and couldn't decide, that her custom bead watch request turned into two. The finished pieces reflected the Czech clam shell bead, one design with the satin crystals and the second design in the aventurine gemstones but in a 2-strand design. Both were absolutely stunning and the perfect accessory for summer! Handmade beaded watch lends a fresh look to a hazy day at the beach! An elegant combination of white pearlized Czech clam shell beads, sterling silver Bali, beads and satin blue Swarovski Crystals. Geneva quartz white watch face. Length is 8-1/4". 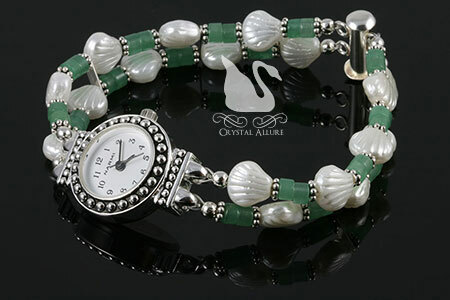 Two strands of white pearlized Czech clam shell beads and seamist aventurine gemstones offer the perfect complement to a watch face dotted in what could be the seashells peaking out of the sand on a beautiful sunkissed beach. 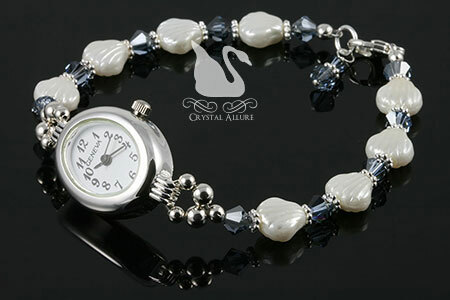 Sterling silver Bali, 2-strand slide clasp and Narmi designer quartz white watch face. Measures 8-1/4". Enjoy your lovely watches Patricia! 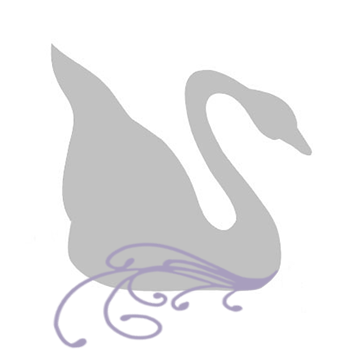 Don't you just love it when one order multiplies to two? Goes to show how good your design was!